Back in 2015 when Angular made the jump from AngularJS to Angular2 (now just Angular) there were a lot of naysayers claiming that this would be the death of Angular, and that React would win out. At that time I evaluated several frameworks to replace an existing front end. The top 2 candidates (as you might guess) were React and Angular. AngularJS had a larger community than React, but the community for Angular2 was small. There seemed to be a very vocal and oft promoted opinion online that this was the time where React would take over once and for all, and Angular would ride off into the sunset. I didn’t buy it, and upon significant evaluation, settled on using Angular for my project. 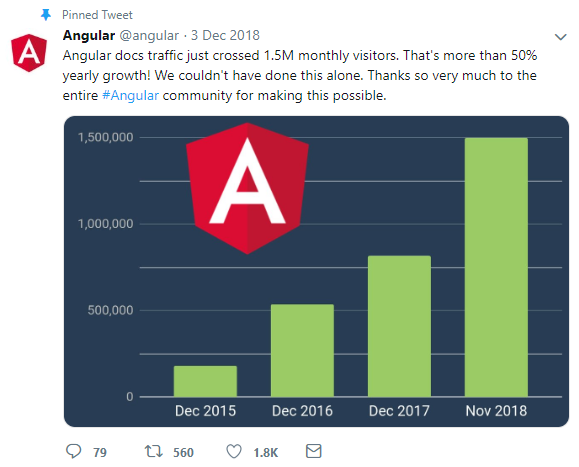 Today I happily ran across this tweet from Angular… looks like the community is alive and well.